The U.S. Bellows exhibit featured a cut-away view of an expansion joint with insulating and abrasion resistant refractory lining and miniature models of various types of metallic expansion joints. Discussions at the booth included how to solve regenerated catalyst and spent catalyst standpipe expansion joint reliability problems. 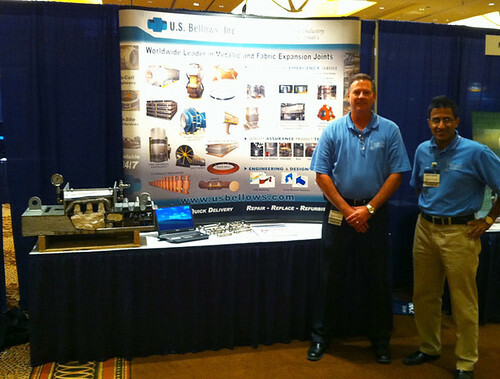 Talk to the engineers at U.S. Bellows about your flue gas expansion joint problems. 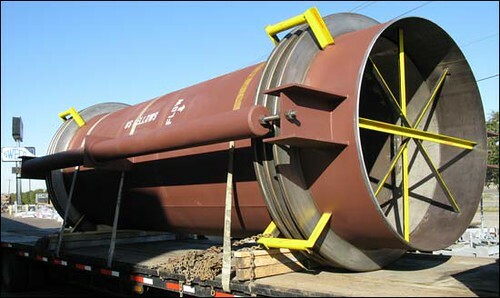 We can help with your fabric expansion joint problems in low pressure flue gas systems. This 30 foot long tied universal thick wall expansion joint is fabricated from carbon steel with 316 stainless steel bellows. The bellows are fabricated from 1/4″ thick flanged and flued heads. It is designed for an axial movement rate of 1/2″ with a lateral movement rate of 1-13/16″. The expansion joint was 100% x-ray tested and air & soap bubble tested prior to shipping.